Shotokan Karate Hawke’s Bay is a member of AJKA-I/New Zealand, and the AJKA-International, with member countries throughout North America, Europe, and now New Zealand. The AJKA-International is especially known for the quality and thoroughness of its international instructor training program. Although new to New Zealand, we anticipate starting an official instructor’s program within the next year, or so, for interested Shotokan practitioners here and in Australia. The AJKA-I Instructor Training Program is designed with two goals in mind. 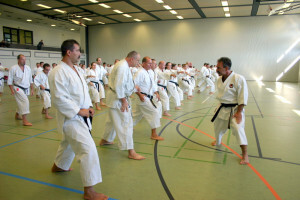 First, to encourage the formal training of karate instructors for the development and understanding of Shotokan Karate-do. Second, to help participants develop the interpersonal, class presentation, and leadership skills necessary to motivate and guide others in their search to understand and master the art of shotokan karate-do. Every person licensed as an instructor by the AJKA-I is required to attend and participate in at least 2 instructor training seminars each calendar year. Every effort is made to conduct these seminars at the individual’s own training site, and/or national and International camps as to minimize travel requirements. Videos and written materials are offered as supplements to the training program. Anyone interested is encouraged to contact me directly with any questions. Please click here full instructor program information.